BLOOMINGTON, Ill.— The Illinois Wesleyan student body has selected R. Given Harper, the George C. and Ella Beach Lewis Endowed Chair of Biology, as the 2015 Student Senate Professor of the Year. As an avian ecologist Harper has taught courses in ecology, ornithology and conservation biology. He has taken students on 10 May Term Tropical Ecology courses in Costa Rica. Harper is currently collaborating with Associate Professor of Biology Will Jaeckle, colleagues at other universities, and a number of IWU students on research to determine if the relationship of eggshell porosity can be used to establish evolutionary relationships among flightless birds. In addition to his own papers, he has published 15 papers in scientific journals with IWU students as co-authors. Harper’s research has been published in The Auk: Ornithological Advances, American Naturalist, Environmental Pollution, Chemosphere, Journal of Field Ornithology, Archives of Environmental Contamination and Toxicology, Journal of Avian Biology, Ecology and Behavioral Ecology. 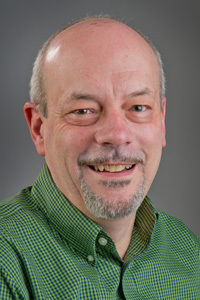 Harper has served as chair of the Biology Department and is currently the Director of the Environmental Studies Program. He served as co-chair of the Premedical/Predental Advisory Committee for three years. Active in sustainability efforts on campus, Harper served as the co-director of the Green Task Force and the co-chair of the Committee for a Sustainable Campus. He and Abigail Jahiel, Associate Director of the Environmental Studies program, contributed a chapter to Strategies for Sustainability: Stories from the Ivory Tower (MIT Press, 2004). A native of Kentucky, Harper received a bachelor’s degree from Transylvania University. He holds a master’s degree from Western Illinois University in zoology and earned a doctorate in biology from Illinois State University. “The Professor of the Year award is a great way for the IWU students to show their professors just how much they value their hard work and support in and out of the classroom,” said Student Senate President Jake Thaker ’17. This year 65 professors were nominated for the award. In this year’s election, Student Senate also announced Sodexo employee Trish Todd as the first recipient for Staff Member of the Year. “Illinois Wesleyan has a phenomenal set of staff members around campus that should also be recognized for their hard work and commitment to students,” said Thaker.